Since 2002, Wagner Tuning has been leading the way with high quality engine parts – including intake manifolds, exhaust manifolds, down pipes and - intercoolers. Their leading edge innovations provide you with the best in performance and the assurance that every product design is 100% accurate on fitment so that even the largest inter-coolers can fit without major modifications to your car. What Sets Wagner Intercoolers Apart From Their Competitors? Wagner Tuning Intercoolers designed their intercoolers so there are no restrictions or dead spots (or shadows) commonly found in stock OEM intercoolers. Instead, their intercoolers are designed to allow for a more uniform filling pushing more air flow through the intercooler. This is one of the most unique and beneficial components that earns Wagner Intercoolers a reputation beyond compare. 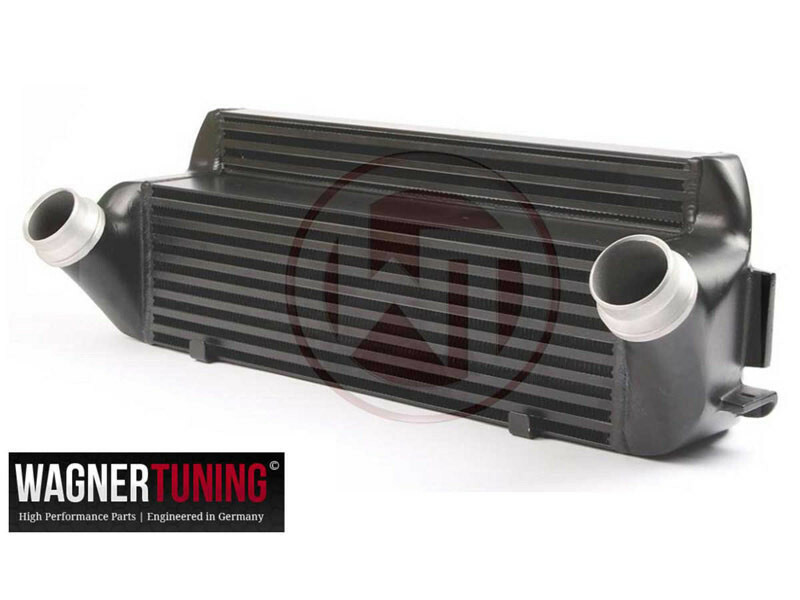 In short, Wagner offers two types of Intercoolers, Performance and Competition - the difference being the type of core. Performance Intercoolers use a Bar & Plate Core while their Competition intercooler uses a Tube Fin. Our Performance Intercoolers have a BAR & PLATE core which offers excellent cooling and improved flow characteristics compared to the OEM unit. The BAR & PLATE construction is relatively heavy so there is certain temperature inertia. Meaning under load the core takes longer to heat, but also longer to cool down once the load is removed. This is fine for on the road but for use on the racetrack this core construction is not particularly suitable as it arrives at a constant cooling performance at varying loads in the full load range. Also, weight reduction is an important consideration for track use. Our Competition Intercoolers have a TUBE FIN core, which offers excellent cooling and flow characteristics compared to both OEM and our Performance Intercoolers. The fine structure of the TUBE FIN core makes them relatively light and exchange heat much faster. This type of core construction takes temperatures relatively quickly, but also very quickly transfers this away again. For a constant cooling performance in a dynamic throttle situation, this is an indispensable feature. Other than in California, the Competition intercooler is suitable for street use as well as at the racetrack. What does EVO1, EVO2 and EVO3 Mean? EVO numbers refer to the amount of air volume they provide. EVO1 versions were developed for use in combination with STOCK Turbochargers providing extremely efficient cooling of the intake charge air. EVO2 and EVO3 Intercoolers allow greater air volume and work in tandem with upgrade turbochargers. Specific Intercoolers also have their inlet and outlet sizes increased and are supplied with matching silicone hoses.